Resolution of acute inflammation is an active event accompanied by biosynthesis of specialized proresolving mediators (SPM). We employed a systems approach to determine the impact of CO in resolution active programs during self-limited inflammation in mice. 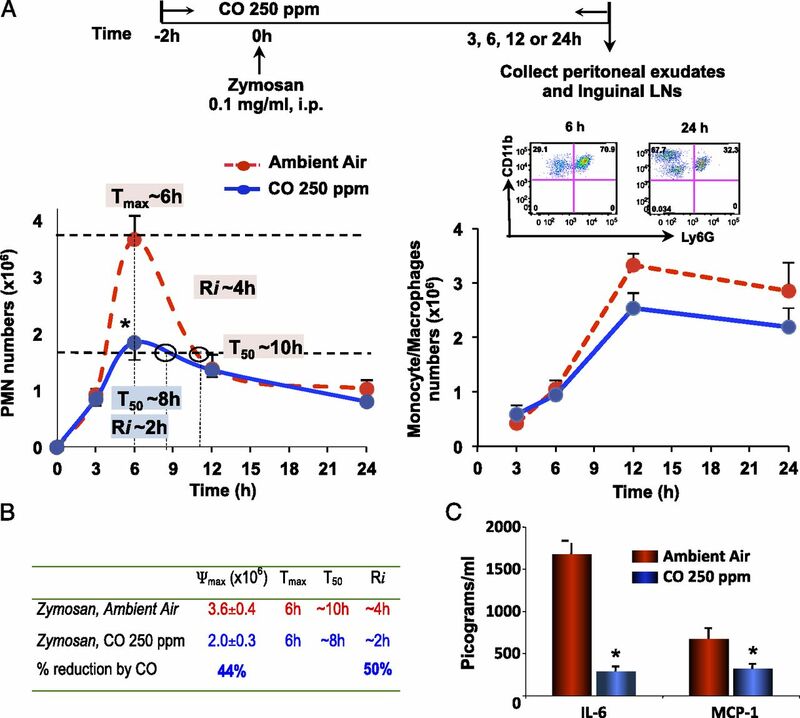 Compared with ambient air, inhaled CO gas (250 ppm) significantly limited PMN infiltration (∼44%, 6 h) into peritoneum and shortened resolution interval from 4 to 2 h. We profiled exudate lipid mediators (LM) via metabololipidomics, CO reduced leukotriene B4 (21 ± 11 versus 59 ± 24 pg/mouse, 6 h), and elevated SPM including resolvin (Rv) D1 (27 ± 4 versus 16 ± 5 pg/mouse) and maresin 1 (26 ± 9 versus 15 ± 3 pg/mouse). With human macrophages, SPM (10 pM–10 nM) elevated heme oxygenase (HO)-1 (∼50%, 8 h). CO also enhanced HO-1 expression and accumulation of RvD1 and RvD5, an action reversed by blockage of a key SPM biosynthesis enzyme 15-lipoxygenase type 1. Compared with normoxia, CO increased ∼30% phagocytosis of opsonized zymosan with human macrophage, which was further enhanced by SPM (∼100%). This CO increased phagocytosis was blocked by 15-lipoxygenase inhibition, and SPM stimulated phagocytosis was diminished by HO-1 inhibition. In murine peritonitis, both pre- and posttreatment with CO inhalation significantly increased macrophages carrying ingested apoptotic PMN in exudates and enhanced PMN apoptosis. Taken together, these results indicate that CO accelerates resolution of acute inflammation, shortens resolution intervals, enhances macrophage efferocytosis, and temporally regulates local levels of lipid mediator/SPM. Moreover, they provide proresolving mechanisms for HO-1/CO, which is part of the SPM-initiated resolution circuit. Inflammation is a fundamental immune response that is normally protective against infection or injury. However, when excessive or uncontrolled, inflammation can lead to various chronic disorders (1–3). The ideal outcome of inflammation is complete resolution, returning to tissue homeostasis. Emerging evidence indicates that resolution of inflammation is an active process that is accompanied by biosynthesis of potent lipid mediators that stimulate resolution (1, 4). Those identified to date include arachidonic acid (AA)-derived lipoxins (LX), ω-3 eicosapentaenoic acid (EPA)–derived E-series resolvin (Rv), and docosahexaenoic acid (DHA)-derived D-series Rvs, protectins (PD), and maresins (1). These endogenous mediators display protective roles in anti-inflammation, proresolution, organ regeneration and are potent analgesics (1). They constitute a new genus of specialized proresolving mediators (SPM) and offer a molecular basis for new anti-inflammatory therapeutics via promoting resolution (1, 5, 6). NO is the first identified gaseous mediator that functions as a signaling molecule (7, 8). More recently, CO and hydrogen sulfide have emerged as endogenous gaseous mediators that possess physiologic roles in cardiovascular, immune, and nervous systems (8, 9). In the cardiovascular system, some of the cytoprotective and tissue-protective actions of heme oxygenase (HO)-1 involve decreases of heme and increases of CO, which in turn increases cGMP and conserves NO to prevent endothelial cell dysfunction and death (10). In addition, a CO-releasing molecule was shown to have anti-inflammatory properties, modulating leukocyte–endothelial interactions in vivo (11). In this context, LXA4 and one of its metabolically stable analogs induce HO-1 expression in endothelial cells (12). During acute lung injury, LXA4 also increases HO-1 in vivo in lungs and ameliorates LPS-induced injury (13). Also, PD1 and LXA4 each amplify HO-1 gene expression in human corneal epithelial cells and counterregulate inflammation during corneal wound healing (14). The contribution of HO-1/CO to resolution of inflammation is of interest and has yet to be established. In this study, we used a systems approach to investigate the relationships between CO and SPM during active resolution of acute inflammation. The present results establish a proresolving feed-forward circuit with inhaled CO that involves SPM activating HO-1/CO, which turns on SPM biosynthesis. FVB mice (6–8 wk; Charles River Laboratories; LabDiet with essential fatty acids from the supplier) and 12/15-lipoxygenase (15-LOX)–deficient mice (6 wk; The Jackson Laboratory) were used in accordance with Harvard Medical Area Standing Committee on Animals (number 02570, C.N. Serhan and number 4435, A.M.K. Choi). CO administration was carried out by L.F. and E.I. Mice were kept in a CO chamber (250 ppm) for 2 h, prior to i.p. injection of 0.1 mg zymosan (Sigma-Aldrich). At designated intervals, mice were euthanized (overdose of isoflurane), periotoneal exudates and inguinal lymph nodes were collected, and resolution indices were calculated (14). Exudates were taken for differential counts determined by nuclear morphology using Cytofuge (Statspin) stained with Wright Giemsa stain. To determine exudate leukocyte subtypes, we used flow cytometery (FACSCanto II) with individual fluorophore-conjugated Ab or combinations of anti-mouse Ly-6G (clone RB6-8C5) for PMN, anti-mouse CD11b (clone M1/70) for myeloid cells, or anti-mouse F4/80 Ab (clone BM8) for macrophages. Abs were from BD Biosciences and eBioscience. All samples for liquid chromatography (LC)-tandem mass spectroscopy (MS/MS) analysis were extracted using SPE columns. Briefly, columns were equilibrated with 1 column volume of methanol and 2 volumes double distilled H2O. Prior to extraction, deuterium-labeled internal standards d-5S-hydroxy-eicosatetraenoic acid (HETE), d4-LTB4, d5-LXA4, and d4-PGE2 (500 pg each) were added to facilitate quantification of sample recovery. Sample supernatants were diluted with 10 volume of double distilled H2O, acidified (pH ∼ 3.5), and immediately loaded onto SPE column. After loading, columns were washed with 1 volume of neutral double distilled H2O and hexane. Samples were eluted with 6 ml methyl formate and taken to dryness. Samples were suspended in methanol/water for LC-MS/MS. The LC-UV-MS/MS system, QTrap 5500 (ABSciex), was equipped with an Agilent HP1100 binary pump and diode-array detector. An Agilent Eclipse Plus C18 column (50 mm × 4.6 mm ×1.8 μm or 100 mm × 4.6 mm × 1.8 μm) was used with a gradient of methanol/water/acetic acid of 60:40:0.01 (v/v/v) to 100:0:0.01 at 0.5-ml/min flow rate. To monitor and quantify the levels of targeted lipid mediators (LM), a multiple reaction monitoring (MRM) method was devised with signature ion fragments for each molecule. Identification was conducted using published criteria (as summarized in Ref. 15) using retention times and at least six diagnostic ions. Calibration curves were obtained using synthetic and authentic LM mixtures (they included d8-5S-HETE, d4-LTB4, d5-LXA4, d4-PGE2, RvD1, RvD2, RvD5, PD1, MaR1, RvE1, RvE2, LXA4, LXB4, LXA5, PGE2, PGD2, PGF2α, thromboxane TX(B2), PGE3, PGF3α, TXB3, LTB4, 17S-hydroxy-docosahexaenoic acid (HDHA), 14S-HDHA, 7S-HDHA, 4-HDHA, 18-hydroxy-eicosapentaenoic acid (HEPE), 15S-HEPE, 12S-HEPE, 5S-HEPE, 15S-HETE, 12S-HETE, and 5S-HETE) at 12.5, 25, 50, and 100 pg. Linear calibration curves for each were obtained with r2 values that ranged 0.98–0.99. Quantification was carried out based on peak area of the MRM transition, and the linear calibration curve was obtained with authentic standard for each compound. In case synthetic or biogenic standards for a given product were not available (i.e., LXB5, PGD3), calibration curves for products with similar chromatographic behaviors (i.e., tri, di-, or mono-HETEs) to the analyte of interest were used. PBMC were isolated from human whole blood and cultured in RPMI 1640 medium with 10 ng/ml human recombinant GM-CSF at 37°C for 7 d (16). In some experiments, knockdown of 15-LOX-1 was carried out with short hairpin RNA (shRNA) plasmid (Origene, Rockville, MD). GM-CSF–differentiated human macrophages were incubated with or without 500 ppm CO for 4 h. For SPM incubation, cells were incubated with SPM for indicated time points from 0.01 to 10 nM. LXA4 was from Calbiochem, RvD1, RvD2, and RvE1 were from Cayman Chemical (Ann Arbor, MI). Both PD1 and MaR1 were prepared by total organic synthesis as in the Serhan and Petasis review (17) for NIH Program Project (P01-GM095467, CNS). Cells were collected and permeabilized, and intracellular staining was carried out using a FITC-conjugated anti–HO-1 Ab (Abcam, Cambridge, MA), anti–15-LOX Ab (Origene), or anti–cyclooxygenase (COX)-2 Ab (Cayman Chemical). Expression levels of HO-1, 15-LOX, and COX-2 were monitored by flow cytometry. For mRNA expression, total RNA was extracted from macrophages with TRIzol reagent (Invitrogen), followed by reverse transcription and quantitative PCR (qPCR) using RT2 SYBR Green qPCR Mastermix (Qiagen). 18S rRNA was used as the internal control. HO-1 enzymatic activity in human macrophages was determined as in Ref. 18. Recombinant human 15-hydroxyPG dehydrogenase (15-PGDH)/eicosanoid oxidoreductase (Cayman Chemical) was prepared in Tris-HCl buffer (50 mM [pH 7.4], 25°C; 0.5 μg/90 μl). For CO treatment, enzyme solution was incubated in an atmosphere enriched in CO (bubbling of pure CO gas into solution) for 5 min. Substrate RvD1 (100 ng) was taken to dryness under N2 stream and resuspended in 10 μl Tris-HCl buffer (50 mM [pH 7.4]) containing cofactor NAD+ (10 mM). Enzymatic reactions were initiated by addition of substrate and cofactor to enzyme solution, and 15-PGDH activity was monitored for 20 min (25°C) by a spectrophotometer at 340 nm for the formation of NADH from NAD+. The concentration of NADH (millimoles) was calculated from extinction coefficient. GM-CSF–differentiated human macrophages were adhered onto 96-well plates (5 × 104 cells/well) and incubated with or without 500 ppm CO for 4 h. Cells were then treated with the indicated concentration of SPM for 30 min, followed by incubation with FITC–Zymosan A or apoptotic human PMN (see below) for 1 h. Plates were gently washed, extracellular fluorescence was quenched by trypan blue, and phagocytosis was determined by measuring total fluorescence (Ex 493/Em525 nm) using a fluorescent plate reader (Molecular Probes, Eugene, OR). Human PMNs were isolated from whole blood withdrawn from healthy volunteers who denied taking medications 2 wk prior to donation by venipuncture in a heparinized syringe (Partners Human Research Committee Protocol 1999-P-001297). PMNs were labeled with the green fluorescent intracellular dye CFSE (10 μM, 30 min at 37°C; Molecular Probes, Eugene) and allowed to undergo spontaneous apoptosis overnight (16–18h) in PBS++ (5 × 106 cells/ml). PMN were allowed to undergo spontaneous apoptosis overnight (16 h) in RPMI 1640 medium containing 1% FBS (5 × 106 cells/ml) with or without CO treatment (500 ppm). Apoptosis was monitored by Annexin V and propidium iodide (PI) staining (Apoptosis detection kit; BD Biosciences). Results are expressed as mean ± SEM. Statistical analysis was performed using nonparametric tests including Mann–Whitney U test for two group comparisons and Kruskal–Wallis test for multiple group comparisons with posthoc analysis using Dunn's test (GraphPad Prism, La Jolla, CA). A p value <0.05 was considered to be significant. Within the inflammation–resolution map of acute inflammation demonstrated earlier (19), we first assessed whether inhaled CO alters the signature of resolution programs via determining resolution indices in a self-limited resolving murine peritonitis. For these, we used a systems approach that monitored leukocyte traffic and functions as well as MS-based lipid mediator (LM) metabololipidomics of inflammatory exudates. In this study, CO (250 ppm) was inhaled for 2 h, prior to initiating peritonitis (see Fig. 1A timeline). Mice were kept either within a CO chamber or ambient air until collection of peritoneal exudates at the indicated time intervals 3–24 h. In ambient conditions, zymosan at 0.1 mg/mouse gave a self-resolving time course, initiating a rapid infiltration of PMN that reached maximum at 6 h followed by a decline, which was monitored by flow cytometry (Fig. 1A). At 6 h, PMN were the major cell type (∼70%) in exudates as determined by PMN marker Ly-6G. At 24 h, monocytes/macrophages became dominant cell type (∼40%, CD11b+Ly-6G−) (Fig. 1A, inset). Inhaled CO accelerates resolution of inflammation: shortens resolution interval. Mice (FVB male, 6–8 wk) were kept in ambient air or CO chamber (250 ppm) for 2 h, prior to i.p. injection of 0.1 mg zymosan. (A) At indicated time points, mice were sacrificed, and PMN (left panel) and monocytes/macrophages (right panel) were identified by flow cytometry. Inset, Representative dot plots. (B) Resolution indices. (C) Cytokines in cell-free lavages at 3 h. Results are expressed as mean ± SEM of four mice with each treatment at each time point. *p < 0.05, ambient air versus 250 ppm CO.
To quantitate resolution, we defined resolution parameters of acute inflammation and introduced indices (19). Hence, we monitored Ψmax, the maximal PMN numbers in the exudates; Tmax, the time point when PMN numbers reach maximum; T50, the time point when PMN numbers reduce to 50% of maximum; and Ri (resolution interval), the time period when 50% PMN are lost from the exudates (i.e., T50 − Tmax). Mice in room air gave a resolution interval (Ri) of 4h (Fig. 1B). For direct comparison, CO treatment significantly reduced maximal PMN infiltration (Ψmax) by >40% and shortened resolution interval Ri by ∼ 50% (Fig. 1B). In comparison, CO did not significantly alter the numbers of monocytes/macrophages (Fig. 1A). Exudate leukocytes collected from mice within either CO chamber or ambient air were >95% viable as determined by trypan blue exclusion (n = 4). In addition, we screened a panel of cytokines and found that CO reduced IL-6 and MCP-1 levels at 3 h compared with ambient air conditions (Fig. 1C). Taken together, these results demonstrated that CO reduced PMN infiltration in acute inflammation and accelerated resolution. To address the mechanisms for CO accelerated resolution, we next carried out mass spectrometry-based metabololipidomics focusing on local acting LM including three metabolomes (Supplemental Fig. 1). AA-metabolome includes COX products PG and TX, 5-LOX products LTs, and LOX interaction products LX. EPA-metabolome includes Rv E series compounds RvE1 and RvE2, and their biosynthetic pathway marker 18-HEPE. DHA-metabolome includes Rv D-series, protectins, and maresins as well as their biosynthetic pathway markers 17- and 14-HDHA. Fig. 2A shows MRM chromatographs of AA, EPA, and DHA pathway products identified in peritoneal exudates. LMs were profiled using MRM and identified by direct comparison with synthetic and authentic standards using matching criteria including retention time, characteristic fragmentation patterns, and at least six diagnostic ions (Fig. 2A, Supplemental Fig. 2). We quantified each mediator in exudates and found that CO treatment reduced proinflammatory LTB4 and PGE2 during the early inflammatory phase (Fig. 2B). Inhaled CO also gave higher levels of SPM including RvD1 (27 ± 4 pg/mouse with CO versus 16 ± 5 pg/mouse with ambient air), RvE2 (1201 ± 197 pg/mouse with CO versus 864 ± 125 pg/mouse with ambient air), and MaR1 (26 ± 9 pg/mouse with CO versus 15 ± 3 pg/mouse with ambient air) at 6 h (Fig. 2C, Supplemental Table I). In comparison, RvD5 accumulated in the exudates and reduced by CO treatment at 6 h. These SPM were generated from endogenous substrate DHA during inflammation–resolution without supplementation. We next calculated the relation between proresolving and proinflammatory lipid mediators. SPM/LTB4 ratios were significantly higher in CO group at 6 and 24 h. SPM/PG ratios were also higher in CO inhaled groups at 6 h (Fig. 2D). These results indicate that differential lipid mediator profiles are present following exposure to CO versus ambient air. CO inhalation gave increased proresolving and reduced proinflammatory mediators that can contribute to CO-accelerated resolution. CO regulates local LM/SPM: LM metabololipidomics. (A) MRM chromatographs of AA, EPA, and DHA metabolomes. (B–D) Time course of TxB2, LTB4, PGE2, PGD2 (B), RvD1, RvD2, RvE2, MaR1 (C), and ratio of SPM/LTB4 or SPM/PG (D) in murine peritoneal exudates. Results are expressed as mean ± SEM of four mice with each treatment at each time point. 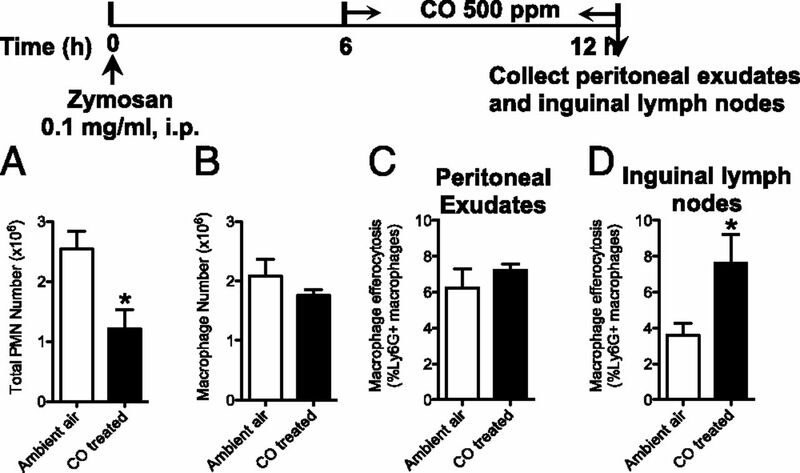 *p < 0.05, ambient air versus 250 ppm CO.
Because CO increased select SPM in vivo (Fig. 2), we questioned whether CO regulates biosynthetic enzymes for SPM. We carried out zymosan-initiated peritonitis with mice deficient in 12/15-LOX (20), the mouse ortholog of human 15-LOX-1 and a key enzyme for SPM biosynthesis (1). In these 12/15-LOX–deficient mice, CO treatment failed to regulate PMN infiltration into peritoneum, whereas wild-type (WT) mice showed ∼40% reduction in PMN in response to CO treatment (Fig. 3A). These results demonstrated that the impact of CO on resolution of acute inflammation is mediated at least in part via 12/15-LOX in mice. To further address the contribution of 15-LOX-1 and translate to human cells, human macrophages were incubated in the absence or presence of 500 ppm CO for 4 h, and mRNA levels of 15-LOX-1 were significantly increased (∼50% increase) by CO treatment (Fig. 3B). 12-LOX and 5-LOX levels were not significantly changed. CO also increased COX-2 mRNA expression. We also questioned whether CO can increase HO-1 expression in macrophages and if this action is dependent on 15-LOX-1 and SPM. In this study, CO treatment significantly increased HO-1 expression ∼20% (Fig. 3C). Blocking 15-LOX-1 expression in macrophages with specific shRNA or inhibitor baicalein diminished CO-induced HO-1 expression (Fig. 3C and Supplemental Fig. 3A). Profiling of LM with metabololipidomics demonstrated that CO treatment of human macrophages significantly increased RvD1 and RvD5 as well as biosynthetic pathway marker 17-HDHA (Fig. 3D). Of note, CO-treated macrophages transfected with 15-LOX-1 shRNA significantly reduced these mediators compared with CO-treated macrophages transfected with scrambled shRNA as the control plasmid. In addition, incubation of macrophages with a nonselective LOX inhibitor baicalein (21) in the presence of CO reduced these mediators ∼70–80% compared with CO alone. In the absence of CO, baicalein also significantly reduced 17-HDHA and 14-HDHA with a trend of decreasing RvD1 and RvD5. In comparison, COX product PGE2 and 5-LOX product LTB4 were not altered by CO or baicalein incubations (Supplemental Fig. 3B). Therefore, CO-enhanced HO-1 expression is mediated in part by upregulating 15-LOX-1 and SPM biosynthesis. CO regulates HO-1 and SPM via mouse 12/15-LOX and human 15-LOX type 1. (A) 12/15-LOX–deficient mice (12/15-LOX–knockout) and WT mice were challenged with 0.1 mg zymosan. CO treatment (250 ppm) was started 2 h before the initiation of peritonitis. Six hours after the initiation of peritonitis, exudates were collected, and PMN numbers were determined. Results are expressed as percent inhibition by CO; mean ± SEM of n = 4. *p < 0.05 versus normoxia group. #p < 0.05 WT versus 12/15-LOX–knockout mice. (B–D) GM-CSF–differentiated human macrophages were incubated with or without CO (500 ppm, 4 h, 37°C). (B) Cells were harvested, mRNA expressions were determined by qPCR, and protein levels were assessed by flow cytometry. Results are expressed as fold change by CO exposure; mean ± SEM, n = 4–8. *p < 0.05 versus without CO treatment. (C, D) Cells were transfected with control plasmid or shRNA against 15-LOX-1 for 72 h and then incubated with or without CO (500 ppm, 4 h, 37°C). Cells were harvested, and HO-1 expression was determined using FITC-labeled anti–HO-1 Ab (C). Results are shown as percent increase of HO-1 above normoxia with control plasmid; mean ± SEM, n = 3. *p < 0.05 versus normoxia with control plasmid; #p < 0.05 versus CO with control plasmid. (D) LM metabololipidomics; mean ± SEM, n = 4. *p < 0.05 versus normoxia with control plasmid; #p < 0.05 versus CO with control plasmid. (E) GM-CSF–differentiated human macrophages were incubated with or without CO (250 ppm, 8 h, 37°C) and then incubated with 0.2 mg serum-treated zymosan (STZ) for 30 min. Results of LM metabololipidomics are expressed as percent change by CO treatment; mean ± SEM, n = 4. *p < 0.05 versus normoxic incubation. (F) Recombinant human 15-PGDH (0.5 U in Tris-HCl [pH 7.4], 25°C) was incubated under normoxia or in a CO-enriched environment for 5 min, followed by addition of substrate RvD1 (100 ng) and cofactor NAD+ (1 mM). NADH formation was monitored for 20 min (25°C) by a spectrophotometer at 340 nm. Results are mean ± SEM, n = 3. *p < 0.05, versus normoxia. The action of CO on SPM was also demonstrated in macrophages incubated with serum-treated zymosan (STZ). With these macrophages, CO treatment not only significantly reduced proinflammatory PGE2 and TXB2, but also increased proresolving RvD1, RvD2, PD1, RvE1 and RvE3 (Fig. 3E), as well as a LX biosynthetic pathway marker 5,15-diHETE (data not shown). Together these results demonstrated that actions of CO in regulating inflammatory responses are likely to be mediated by both reduced proinflammatory and increased proresolving mediators in vitro and in vivo (compare Fig. 2). SPM are subject to further enzymatic metabolism, for example, RvD1 is converted by 15-hydroxyPG dehydrogenase (15-PGDH), an eicosanoid oxidoreductase, to 8-oxo- and 17-oxo-RvD1 that gave dramatically reduced bioactivity (22). Here, we examined whether CO has an impact on the enzymatic inactivation of SPM. Recombinant human 15-PGDH was incubated in an atmosphere enriched in CO gas, or under normoxia for 5 min, followed by addition of substrate RvD1 and cofactor NAD+. Compared to normoxia, CO gas significantly lowered NADH production by > 40% in the presence of RvD1, representing reduced enzymatic activities (Fig. 3F). Thus, CO inhibition of 15-PGDH contributes to increased local SPM accumulation. Next. we addressed whether SPM can directly activate HO-1/CO pathway as part of the proresolving mechanisms. Incubation of macrophages with either LXA4 or RvD1 at 10 nM increased HO-1 expression, which reached maximum at 8 h, giving ∼40 and ∼35% increases, respectively (Fig. 4A). HO-1 levels were monitored using flow cytometry with an FITC-conjugated anti–HO-1 Ab. A panel of SPM (LXA4, RvD1, RvD2, PD1, MaR1, and RvE1) was tested to establish the rank order potencies in human macrophages. At 0.1 nM, RvD1 was the most potent SPM, giving ∼50% induction of HO-1 compared with vehicle, followed by PD1, LXA4, MaR1, RvD2, and RvE1 (Fig. 4B, 4C). In comparison, LXA4, RvD1, RvD2, and MaR1 at 10 nM each are essentially equipotent, followed by PD1 and RvE1. In contrast, the proinflammatory LTB4 at equiconcentrations did not significantly increase HO-1 (Fig. 4C). We also examined HO-1 enzymatic activity and found that RvD1 increased ∼50% HO-1 activity (Fig. 4D) correlating with an increase in protein expression. These results demonstrated that in human macrophages SPM dose dependently increased HO-1 expression. SPMs induce HO-1 with human macrophages. GM-CSF–differentiated human macrophages were incubated with the selected SPM. Cells were harvested, and HO-1 expression was determined using FITC-labeled anti–HO-1 Ab. (A) Time courses with LXA4 or RvD1 (10 nM). Results are expressed as percent increase above vehicle; mean ± SEM, n = 6. (B) Dose-response curves of SPM incubated with macrophages for 8 h. Results are mean ± SEM, n = 3–4. (C) Rank order potencies of SPM at 0.1 and 10 nM. Results are mean ± SEM, n = 4. (D) HO-1 enzymatic activity. Results are expressed as percent increase above vehicle; mean ± SEM, n = 3. *p < 0.05 versus vehicle. Macrophage phagocytosis of apoptotic cells and debris is a cellular hallmark of tissue resolution (1). Next, human macrophages were treated with 500 ppm CO for 4 h, phagocytosis was initiated by addition of FITC–zymosan or CFDA-labeled apoptotic PMN for 1h, the total fluorescence was determined by fluorescent plate reader. CO gas alone significantly enhanced efferocytosis (macrophage ingestion of apoptotic PMN) by ∼35%, compared with without CO (Fig. 5A). Macrophage ingestion of zymosan particles was also increased by CO, and this action was further enhanced with addition of select SPM. For example, CO alone showed ∼30% increases in phagocytosis, and PD1 alone at 0.01 nM also gave ∼ 40% increase. When PD1 was given after CO exposure, they further enhanced phagocytosis with ∼100% increase compared with vehicle controls without CO (Fig. 5B). Similar results were obtained with LXA4 and MaR1 at 0.01 nM. To evaluate the contribution of HO-1 in SPM-enhanced phagocytosis, we incubated human macrophages with SPM in the presence of a HO-1 inhibitor SnPPIX (5 μM). SPM at 0.1 nM each gave significant increases of phagocytosis (30–40%), an action that was abolished by HO-1 inhibition (Fig. 5C). Next, we questioned whether 15-LOX-1 was involved in CO-stimulated phagocytosis and found that knockdown of 15-LOX-1 by shRNA markedly diminished CO-enhanced phagocytosis (Fig. 5D). Taken together, these results indicated that SPM and inhaled CO constitute a proresolving circuit; SPM induced HO-1 expression, which is reported to release CO molecules (reviewed in Ref. 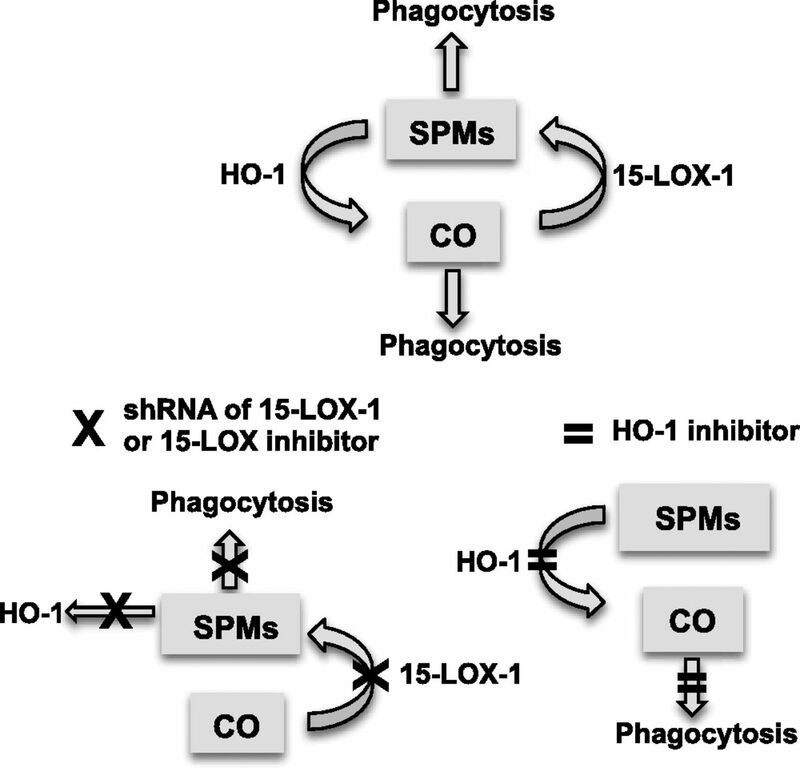 10), and CO in turn increased 15-LOX-1 that biosynthesizes SPM (see below). SPMs and CO Enhance Macrophage Phagocytosis: involvement of HO-1 and 15-LOX-1. (A, B) GM-CSF–differentiated human macrophages were incubated in the absence (black lines) or presence of CO (500 ppm, dashed lines) for 4 h. Cells were then treated with the indicated concentration of SPMs for 30 min, followed by incubation with FITC-labeled zymosan (A, B) or CFDA-labeled apoptotic PMN (A) for 1 h. Results are expressed as percent increase compared with vehicle without CO; mean ± SEM, n = 4–6. (A) *p < 0.05 versus without CO; (B) *p < 0.05 versus vehicle in CO treatment, #p < 0.05 versus vehicle in the absence of CO, $p < 0.05 with versus without CO. (C) Macrophages were incubated with HO-1 inhibitor SnPP IX (5 μM) for 15 min, followed by addition of SPM (0.1 nM) for 30 min and then FITC-labeled zymosan A for 1 h. Results are percent increase of phagocytosis above vehicle; mean ± SEM, n = 3–6. *p < 0.05, SPM versus vehicle with no SnPP IX; #p < 0.05, SnPP IX+ versus SnPP IX− in the presence of each SPM. (D) Macrophages were transfected with control plasmid or shRNA against 15-LOX-1 for 72 h and then incubated in the absence or presence of CO (500 ppm, 4 h). Cells were then incubated with FITC-labeled zymosan A for 1 h. Results are percent increase of phagocytosis from vehicle control; mean ± SEM, n = 4. *p < 0.05 versus normoxia with control plasmid. #p < 0.05 versus CO with control plasmid. Next, we questioned whether inhaled CO enhances macrophage ingestion and clearance of apoptotic PMN in vivo. To this end, exudate cells were collected at 3–24 h after zymosan challenge, and macrophages were labeled with the FITC-conjugated anti-F4/80 Ab, followed by permeabilization of these cells. Ingested PMN were then labeled with PE-conjugated anti-Ly-6G Ab (Fig. 6A). Cells with positive staining of both F4/80 and Ly-6G were then monitored by flow cytometry. During peritonitis, inhaled CO (250 ppm) significantly increased the numbers of macrophages with ingested PMN at 12–24 h in peritoneal exudates, giving ∼60–80% increases of F4/80+Ly-6G+ cells in mice with inhaled CO versus ambient air (Fig. 6B). Similar results were obtained with macrophages collected from inguinal lymph nodes, with CO giving >100% increase at 12 h (4.7 ± 1.1% versus 2.0 ± 0.5%; Fig. 6C). 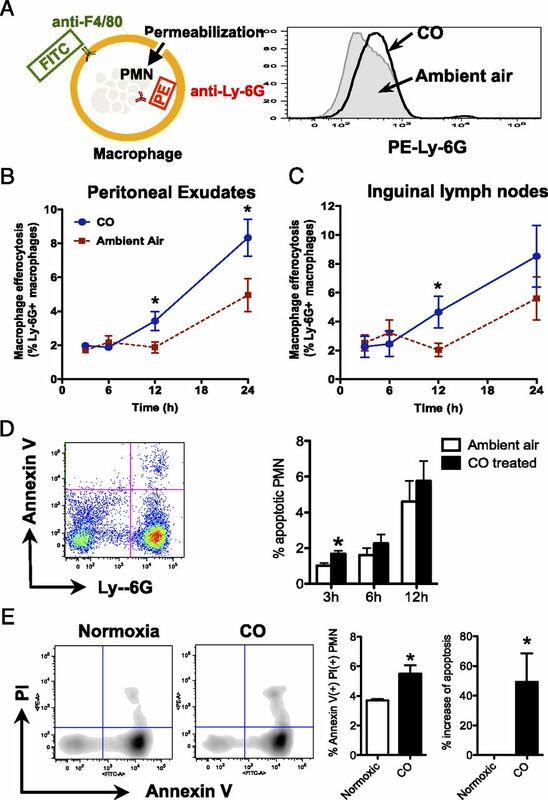 These results indicate that inhaled CO enhances exudate macrophage ingestion of apoptotic PMN and accelerates their exit to lymphatics during resolution of acute inflammation. CO enhances efferocytosis and PMN apoptosis. Mice (FVB male, 6–8 wk) were kept in ambient air or CO chamber (250 ppm) for 2 h, prior to i.p. injection of 0.1 mg zymosan. (A) Macrophages with ingested PMN (Ly6G+ macrophages) were identified by flow cytometry in peritoneal cells (B) and inguinal lymph nodes (C). Results are mean ± SEM, n = 4. *p < 0.05, CO versus ambient conditions. (D) PMN apoptosis in exudate was quantified by flow cytometry with PE-Ly6G Ab and FITC-Annexin V. Results are expressed as percent apoptotic PMN (Ly-6G+Annexin V+); mean ± SEM of three to four mice. *p < 0.05, ambient air versus 250 ppm CO. (E) Human PMNs were cultured with 1% FBS containing RPMI 1640 medium for 16 h with or without CO treatment (500 ppm). PMN apoptosis was quantified by flow cytometry with FITC-Annexin V and PI. Results are expressed as percentage of Annexin V+PI+ PMN and percent increase of apoptosis; mean ± SEM of n = 3. *p < 0.05 versus normoxic group. 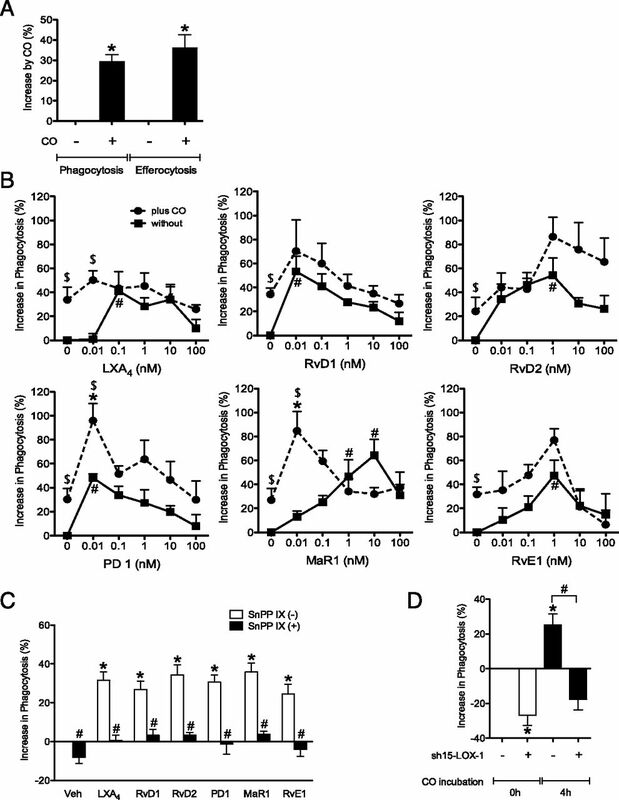 Acceleration of PMN apoptosis facilitates resolution of inflammation (23, 24). Here, we addressed whether CO treatment enhances PMN apoptosis in vivo and in vitro. Mouse peritoneal exudate cells were collected at 3-12 h after zymosan challenge with or without CO treatment (250ppm), and apoptotic PMN was monitored by flow cytometry (Fig. 6D). During peritonitis, inhaled CO significantly increased PMN apoptosis at 3h (Ly-6G+AnnexinV+ cells; 1.0 ± 0.1% with ambient air versus 1.7 ± 0.2% with CO). We also examined apoptosis with isolated human PMN. CO treatment (500 ppm, 16h) significantly enhanced PMN apoptosis ∼ 50% (Annexin V+PI+; 3.7 ± 0.08% with ambient air versus 5.5 ± 0.6% with CO; Fig. 6E). Taken together, these results indicate that CO enhanced PMN apoptosis in vivo and in vitro. We questioned whether CO treatment after zymosan challenge can accelerate resolution of inflammation. In this study, mice were injected with zymosan and then placed in CO chamber (500 ppm) at the peak of PMN infiltration (i.e., 6 h), and 6 h later, exudates were collected (see Fig. 7 timeline). Mice that received CO showed ∼50% lower PMN at 12 h (1.2 ± 0.3 × 106 PMN with CO versus 2.5 ± 0.3 × 106 PMN with ambient air; ∼50% decrease) (Fig. 7A). Macrophage numbers did not change with CO in this setting (Fig. 7B). In addition, CO significantly increased the numbers of macrophages with ingested PMN in inguinal lymph nodes, giving ∼100% increase of F4/80+Ly6G+ cells in mice (7.6 ± 1.6% with CO versus 3.6 ± 0.7% with ambient air; Fig. 7D). These results indicate that CO treatment at the peak of PMN infiltration reduced further PMN infiltration and enhanced clearance of apoptotic PMN into inguinal lymph nodes, thereby accelerating resolution of inflammation. Fig. 8 illustrates the relationships between SPM, CO, and HO-1. CO treatment at the peak of inflammation accelerates resolution. Mice (FVB male, 6–8 wk) were challenged with 0.1 mg zymosan. Six hours after the initiation of peritonitis, mice were placed in CO chamber (500 ppm) or ambient air. Six hours later, mice were sacrificed, and exudate was collected. PMN number (A), macrophage number in exudate (B), and macrophage efferocytosis in exudate (C) and in inguinal lymph node (D) were determined by flow cytometry. Results are expressed as mean ± SEM of four mice. *p < 0.05 versus ambient air group. Proposed SPM-CO circuit. SPM and CO constitute a proresolving circuit. SPM induced HO-1 expression, which releases CO molecules, and CO in turn increased 15-LOX-1, which biosynthesizes SPM. Blockage of 15-LOX-1 diminished CO-induced HO-1 expression and phagocytosis. Inhibition of HO-1 (denoted by =) abolished SPM-stimulated phagocytosis. In the current study using a systems approach with leukocyte trafficking and functions coupled with LM metabololipidomics, we mapped the impact of inhaled CO on acute inflammation–resolution programs. CO and bilirubin are formed physiologically during HO degradation of heme molecules (10). Emerging evidence has demonstrated CO as a cellular signaling molecule with anti-inflammatory properties in several physiological and pathophysiological processes (10). Our present findings demonstrated that inhaled CO exhibits proresolving actions in that CO stimulates resolution programs. These proresolving actions of inhaled CO include the following: 1) limiting PMN infiltration (Fig. 1), 2) elevating SPM accumulation (Figs. 2, 3), 3) enhancing macrophage functions in clearing both microbial particles (Fig. 5) and apoptotic PMN (Fig. 6B, 6C), and 4) increasing PMN apoptosis (Fig. 6D, 6E). Summation of these multipronged actions of CO led to accelerated PMN clearance and resolution, even when the monocyte/macrophage numbers did not increase with CO inhalation. CO was demonstrated to display anti-inflammatory properties. For example, CO and bilirubin have direct vasorelaxant properties via stimulation of both cGMP-dependent and cGMP-independent potassium channels (reviewed in Ref. 10). In mice, low doses of CO ameliorate collagen-induced arthritis and prevent bone destruction and decreasing anti-collagen Abs and numbers of osteoclasts (25). In a hind-limb ischemia–reperfusion injury, inhaled CO reduced skeletal muscle injury and tissue and serum cytokines (26). In addition, in nonhuman primates, CO exposure (500 ppm, 6 h) following LPS inhalation protects lung inflammation, reducing TNF-α release in bronchoalveolar lavage fluid and airway neutrophil influx (27). In recent years, CO-releasing molecules have been developed to facilitate local CO delivery. CO-releasing molecules directly inhibit human PMN adhesion molecules including CD11b and L-selectin, as well as modulate leukocyte–endothelial interaction under flow, reducing PMN capture and rolling (11). Besides these anti-inflammatory properties of CO, our current results extended CO’s protective roles to include proresolving properties such as accelerating resolution of acute inflammation and stimulating macrophage phagocytotic functions. Earlier we defined resolution of acute inflammation with resolution indices, permitting quantitative assessment of the proresolving properties of endogenous mediators. For example, in murine peritonitis, RvE1 accelerates the onset of resolution (Tmax), whereas PD1 and RvD1 shorten the resolution interval (Ri) (19, 28). In allergic airway inflammation, RvE1 (29) and angiopoietin-1 (30) shorten Ri. These indices were also used to evaluate several widely used pharmaceutical agents. Among them, the commonly used local anesthetic lidocaine delays onset of resolution (Tmax and T50), whereas the volatile anesthetic isoflurane accelerates resolution (31). Recently, we found that during Escherichia coli infection, a widely used antibiotic ciprofloxacin initiates the onset of resolution (Tmax) at an earlier time and, in addition, reduces Ri (32). In this study, we demonstrated that a gaseous mediator, namely CO, also accelerates resolution of acute inflammation, reducing the magnitude of PMN infiltration (Ψmax) and shortening resolution interval Ri (Fig. 1). As part of the mechanism(s) of action, CO regulates inactivating enzymes for LM and specifically SPM. CO possesses high-binding affinity to heme molecules and inhibits heme-containing enzymes. In this regard, CO alters platelet aggregation via blocking a platelet cytochrome P450 enzyme (33), which was identified later as the heme containing TX synthase (34). These earlier findings with TX synthase are consistent with our present results that show TX levels were significantly reduced with inhaled CO (Fig. 2B). In human PMN, CO blocks the ω-oxidation of LTB4 and production of 20-hydroxy-LTB4 and 20-carboxy-LTB4 (35), likely via CO inhibition of cytochrome P450 CYP4A enzymes involved in LTB4 ω-oxidation (36). Along these lines, specific SPM such as PD1 and RvD6 also undergo carbon-22 oxidation at their carbon-22 ω-end position at sites of inflammation and with human leukocytes (37). Similarly, RvE1 can be converted locally by human PMN to both 20-hydroxy-RvE1 and 19-hydroxy-RvE1, potentially products of P450 enzymes acting on RvE1 (38, 39). In addition, we report in this paper that CO inhibits enzymatic conversion of RvD1 by recombinant human 15-PGDH (Fig. 3F). 15-PGDH does not contain heme binding domain according to the National Center for Biotechnology Information conserved domain search (http://www.ncbi.nlm.nih.gov/Structure/cdd/wrpsb.cgi). Human monocytes (40) and macrophages express 15-PGDH. CO treatment of macrophages did not significantly change mRNA levels of 15-PGDH (data not shown). Exposure of this enzyme to CO did reduce the inactivation of RvD1 (Fig. 3F). Hence, reducing the activity of 15-PGDH by CO can lead to accumulation of local levels of SPM in vivo in exudates and, as such, may provide a mechanism for CO elevation of proresolving mediators (i.e., SPM) identified in vivo. The accumulation of LM/SPM is a result of both biosynthesis and further downstream metabolism and likely to be dependent on the cellular composition within exudates. It is noted that CO significantly increased RvD2 at 12 h (∼30% PMN and ∼40% monocytes/macrophages), whereas reduced RvD2 at 3 and 6 h (∼40–70% PMN and ∼7–15% monocytes/macrophages). Hence, it is possible that CO can differentially regulate both biosynthetic and downstream metabolic enzymes within PMN and macrophages in the initiation (3–6 h) versus resolution (12 h) phases. CO also increased expression of 15-LOX-1 (Fig. 3), a key SPM biosynthetic enzyme. Reduction/knockdown of 15-LOX-1 by shRNA or blockage with a LOX inhibitor baicalein (21) diminished CO-induced SPM accumulation in human macrophages (Fig. 3D, Supplemental Fig. 3B). These are consistent with baicalein reduction of 12/15-LOX products in mice during macrophage efferocytosis, where it lowers 12-HETE, 15-HETE, 17-HDHA, and LXA4 (19). Therefore, CO regulates SPM levels likely via at least two sites: 1) enhancing SPM production by increasing 15-LOX type 1 expressed in human (Fig. 3B) and 12/15-LOX in mice; and 2) inhibiting inactivation via further metabolism by CO-sensitive P450-like enzymes (31) and 15-PGDH (Fig. 3F). In addition, our current results point to a shift in SPM profile and levels initiated by inhaled CO gas that likely displays higher affinity for P450-like enzymes (that inactivate SPM) than for LOX (that biosynthesizes LM/SPM). Taken together, these lead to increased SPM accumulation (RvD1, RvD2, RvE2, and MaR1; Fig. 2D) in exudates observed in the present studies in peritonitis as well as RvD1 and RvD5 accumulation in human macrophages (Fig. 3D, Supplemental Fig. 3B). 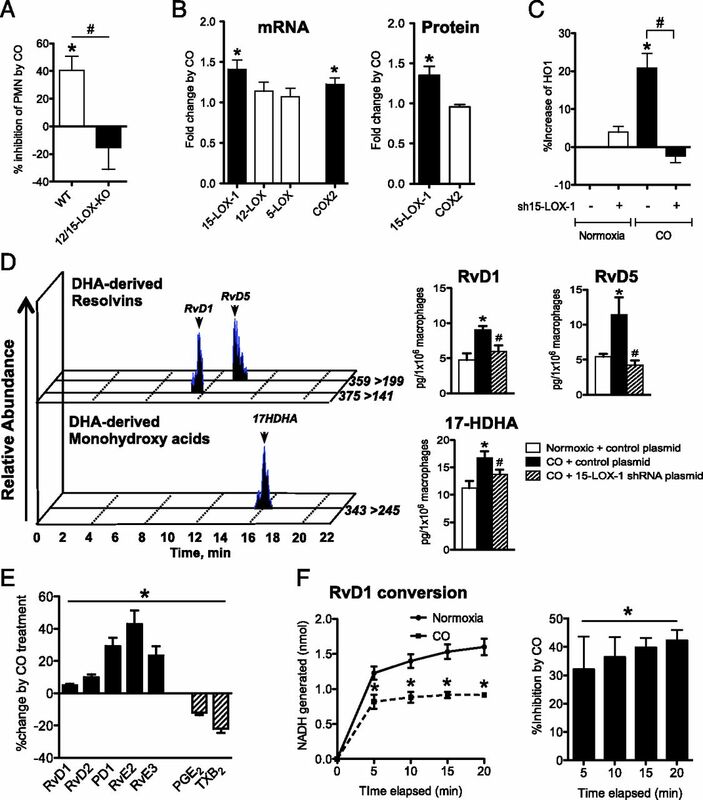 LXA4, an arachidonic acid–derived SPM (1), regulates HO-1 in human endothelial cells (12). LXA4 increases HO-1 expression in corneal epithelial cells and promotes corneal wound healing in mice. In vivo deletion of 12/15-LOX gives exacerbated inflammation and impaired wound healing, accompanied by reduced HO-1 expression (14). These are in line with the present findings that SPM including AA-derived LXA4, EPA-derived RvE1, as well as DHA-derived RvD1, RvD2, PD1, and MaR1, dose dependently amplified HO-1 expression in human macrophages (Fig. 4). Of note, LOX inhibition by baicalein reduced SPM levels, HO-1 expression, and phagocytosis induced by CO (Figs. 3, 5). In summation, we demonstrate that inhaled CO accelerated resolution of inflammation. In this regard, low-dose CO is classified as a proresolving gas. Specifically, inhaled CO promotes phagocyte ingestion of apoptotic PMN and their exit to lymphatics. As part of its mechanism, CO increased 15-LOX type-1 expression and inhibited 15-PGDH activity, leading to SPM accumulation at sites of inflammation, and SPM in turn stimulate macrophage phagocytosis. In addition, SPM increased expression of HO-1, which releases CO. Taken together, these results demonstrate a link between two pathways that amplify each other, namely 15-LOX/SPM and HO-1/CO, constituting a proresolving circuit (Fig. 8). They also indicate that low-dose CO inhalation may have a wide range of uses in diseases where inflammation is uncontrolled and resolution mechanisms can be activated to stimulate clearance and homeostasis. C.N.S. is an inventor on patents (Rvs) assigned to Brigham and Women’s Hospital and licensed to Resolvyx Pharmaceuticals. C.N.S. was scientific founder of Resolvyx Pharmaceuticals and owns founder stock in the company. The interests of C.N.S. were reviewed and are managed by the Brigham and Women’s Hospital and Partners HealthCare in accordance with their conflict of interest policies. The other authors have no financial conflicts of interest. We thank Mary H. Small for expert assistance in manuscript preparation and Laura Fredenburgh and Emeka Ifedigbo for carrying out CO administration. This work was supported by National Institutes of Health Grants P01-HL108801 and P01-GM095467. 2007. Resolution phase of inflammation: novel endogenous anti-inflammatory and proresolving lipid mediators and pathways. Annu. Rev. Immunol. 25: 101–137. 2010. Inflammation 2010: new adventures of an old flame. Cell 140: 771–776.
. 2000. Novel functional sets of lipid-derived mediators with antiinflammatory actions generated from ω-3 fatty acids via cyclooxygenase 2-nonsteroidal antiinflammatory drugs and transcellular processing. J. Exp. Med. 192: 1197–1204. 2010. Anti-inflammatory agents: present and future. Cell 140: 935–950.
. 2006. The discovery of nitric oxide and its role in vascular biology. Br. J. Pharmacol. 147(Suppl. 1): S193–S201.
. 2009. Signaling by gasotransmitters. Sci. Signal. 2: re2.
. 2012. Hydrogen sulfide: an endogenous mediator of resolution of inflammation and injury. Antioxid. Redox Signal. 17: 58–67.
. 2008. Pharmacological and clinical aspects of heme oxygenase. Pharmacol. Rev. 60: 79–127.
. 2007. Carbon monoxide-releasing molecules modulate leukocyte-endothelial interactions under flow. J. Pharmacol. Exp. Ther. 321: 656–662.
. 2005. Novel lipid mediator aspirin-triggered lipoxin A4 induces heme oxygenase-1 in endothelial cells. Am. J. Physiol. Cell Physiol. 289: C557–C563.
. 2007. 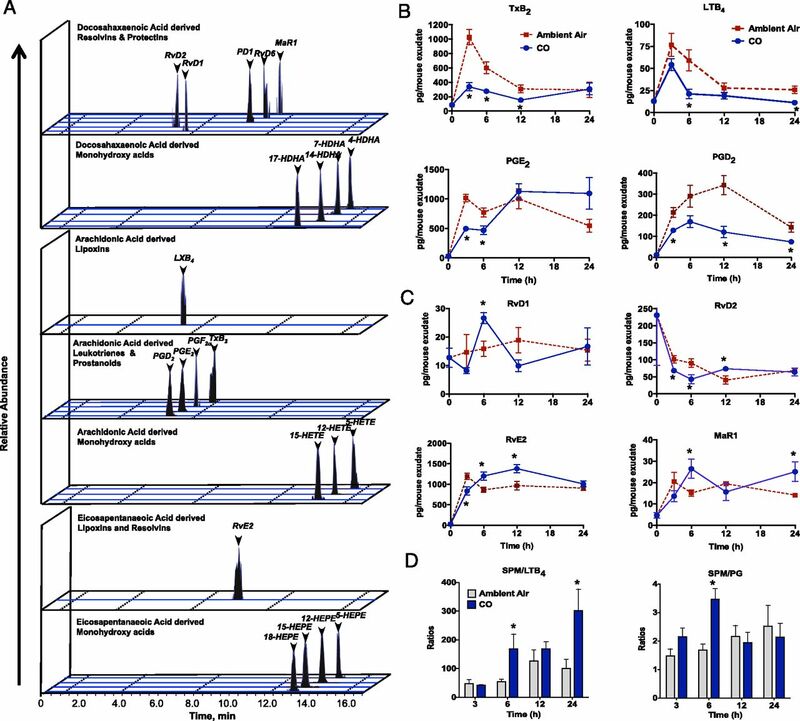 Posttreatment with aspirin-triggered lipoxin A4 analog attenuates lipopolysaccharide-induced acute lung injury in mice: the role of heme oxygenase-1. Anesth. Analg. 104: 369–377.
. 2007. Interdependence of lipoxin A4 and heme-oxygenase in counter-regulating inflammation during corneal wound healing. FASEB J. 21: 2257–2266.
. 2012. Specific lipid mediator signatures of human phagocytes: microparticles stimulate macrophage efferocytosis and pro-resolving mediators. Blood 120: e60–e72.
. 2010. Resolvin D1 binds human phagocytes with evidence for proresolving receptors. Proc. Natl. Acad. Sci. USA 107: 1660–1665.
. 2011. Resolvins and protectins in inflammation resolution. Chem. Rev. 111: 5922–5943.
. 2000. Heme oxygenase activity: current methods and applications. Methods Mol. Biol. 99: 369–391.
. 1996. Disruption of 12/15-lipoxygenase expression in peritoneal macrophages: enhanced utilization of the 5-lipoxygenase pathway and diminished oxidation of low density lipoprotein. J. Biol. Chem. 271: 24055–24062.
. 1982. Selective inhibition of platelet lipoxygenase by baicalein. Biochem. Biophys. Res. Commun. 105: 1090–1095.
. 2007. Resolvin D1 and its aspirin-triggered 17R epimer: stereochemical assignments, anti-inflammatory properties, and enzymatic inactivation. J. Biol. Chem. 282: 9323–9334.
. 2013. The resolution of inflammation. Nat. Rev. Immunol. 13: 59–66.
. 2012. Resolvin E1 promotes phagocytosis-induced neutrophil apoptosis and accelerates resolution of pulmonary inflammation. Proc. Natl. Acad. Sci. USA 109: 14983–14988.
. 2012. Heme oxygenase-1 end-products carbon monoxide and biliverdin ameliorate murine collagen induced arthritis. Clin. Exp. Rheumatol. 30: 73–78.
. 2012. Inhalation of carbon monoxide reduces skeletal muscle injury after hind limb ischemia-reperfusion injury in mice. Am. J. Surg. 203: 488–495.
. 2010. Evaluation of inhaled carbon monoxide as an anti-inflammatory therapy in a nonhuman primate model of lung inflammation. Am. J. Physiol. Lung Cell. Mol. Physiol. 299: L891–L897.
. 2011. MicroRNAs in resolution of acute inflammation: identification of novel resolvin D1-miRNA circuits. FASEB J. 25: 544–560.
. 2008. Resolvin E1 regulates interleukin 23, interferon-γ and lipoxin A4 to promote the resolution of allergic airway inflammation. Nat. Immunol. 9: 873–879.
. 2011. Adenovirus-delivered angiopoietin 1 accelerates the resolution of inflammation of acute endotoxic lung injury in mice. Anesth. Analg. 112: 1403–1410.
. 2008. Anesthetics impact the resolution of inflammation. PLoS One 3: e1879.
. 2012. Infection regulates pro-resolving mediators that lower antibiotic requirements. Nature 484: 524–528.
. 1982. Alteration of platelet aggregation by cigarette smoke and carbon monoxide. Thromb. Haemost. 48: 286–288.
. 1987. Inhibition of platelet aggregation by carbon monoxide is mediated by activation of guanylate cyclase. Mol. Pharmacol. 32: 497–504.
. 1984. ω-oxidation is the major pathway for the catabolism of leukotriene B4 in human polymorphonuclear leukocytes. J. Biol. Chem. 259: 10181–10187.
. 1993. A novel form of cytochrome P-450 family 4 in human polymorphonuclear leukocytes: cDNA cloning and expression of leukotriene B4 ω-hydroxylase. J. Biol. Chem. 268: 9376–9380.
. 2003. Novel docosatrienes and 17S-resolvins generated from docosahexaenoic acid in murine brain, human blood, and glial cells: autacoids in anti-inflammation. J. Biol. Chem. 278: 14677–14687.
. 2006. Metabolic inactivation of resolvin E1 and stabilization of its anti-inflammatory actions. J. Biol. Chem. 281: 22847–22854.
. 2008. Resolvin E1 metabolome in local inactivation during inflammation-resolution. J. Immunol. 180: 3512–3519.
. 1996. Lipoxin A4 and B4 are potent stimuli for human monocyte migration and adhesion: selective inactivation by dehydrogenation and reduction. J. Exp. Med. 183: 137–146.